PlanET Biogas Solutions plans and constructs biogas plants for renewable energy, organic fertilizer and industrial waste digestion with electrical output ranging from 50 kW to several megawatts. 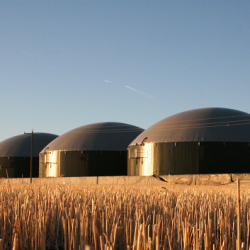 Our experienced construction teams are in charge of installing and commissioning the biogas plant. Numerous highly trained specialists perform the various phases of construction under the supervision and direction of our experienced project managers. Vertical integration and the use of in-house components ensures a quality installation every time. By working with PlanET as the general contractor you are reducing interfaces between sub-contractors which will simplify your involvement in the project.